With ReadSpeaker webReader, the content on a website can be read aloud to you. Just one click, and the text on a web page is simultaneously read aloud and highlighted so you can easily follow along, regardless of device or where you may be. This makes the content more accessible and visiting the website is a more enriching experience. As a user, you don't have to download anything. 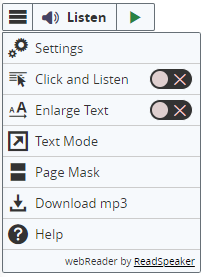 Clear instructions on how to use each feature are provided in the Help Tool, which is found in the toolbar. Try reading through the Help Tool to pick up ideas on how to make optimal use of webReader's features! Many of the webReader tools and features also have a dedicated access key. Access keys are activated with different modifier keys, depending on the browser and operating system used (see list of modifier keys for different environments here https://en.wikipedia.org/wiki/Access_key). Inside webReader, you can use tab/shift+tab to navigate and press enter to activate a certain button or option. Cookies: webReader is best used with cookies enabled, as it will allow the user’s personal settings to be saved between sessions.